On Tuesday, the Office of the Actuary in the Health & Human Services Department published a report into future U.S. healthcare spending, confirming that it will be growing faster than economic growth. This is due to a combination of factors, predominantly by widening coverage, as directed by Obamacare, the ever-aging American population and greater demand upon existing services. Healthcare expenditure are expected to increase by 6% annually by 2019. The Office of the Actuary in the Health & Human Services Department report described the rising expense as “relatively modest.” President of the American Action Forum Douglas Holtz-Eakin doesn’t agree saying that “the bill [for healthcare] will continue to grow faster than the economy, which is what pays the bill.” In 2013, healthcare accounted for 17.4% of the overall economy. By 2024, this will have risen to 19.6%, nearly every $1 out of every $5 will be spent on healthcare. Where is healthcare spending going and how to plan for higher costs? 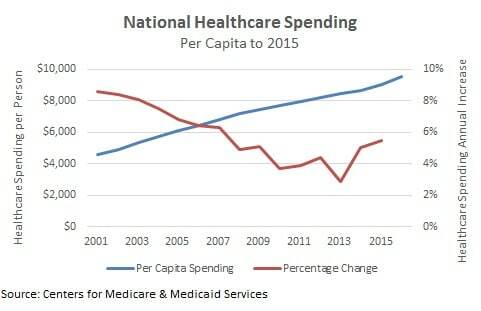 While the pace of healthcare spending slowed over the 12 years to 2013, the pace of economic growth and wages slowed even faster and healthcare spending has started increasing at a much faster pace. With the general economy stuck growing under 3% a year, wages and social security benefits are going nowhere. Further, the investments put aside that were supposed to cover retirement expenses won’t be growing as fast as the slowing economy weighs on corporate profits. With the government preoccupied with trying to make Obamacare work and forcing people onto health registries, the burden of rising health costs is increasingly falling on retirees. The Centers for Medicare & Medicaid Services has recently announced that per capital healthcare spending climbed to over $9,500 in 2015. That annual bill for healthcare may be manageable for a working family but it amounts to 72% of the average annual social security benefit. Healthcare spending is already a major part of your expenses in retirement. While spending on things like transportation and housing decrease, spending on healthcare increases significantly from just 9% of total costs at age 65 to more than 18% of your expenses by age 85. As 401K investment portfolios stagnate and healthcare costs increase, the 4% withdrawal rate you planned for in retirement may not be enough. Besides saving more for retirement and planning on higher healthcare costs, there are a couple of things you can do to prepare. One of the five biggest regrets in retirement is that people didn’t take better care of their health. One nursing study found that changing to a heart-healthy diet can save up to $830 a year in associated medical costs when you’re older. Make sure you hold investments in real assets like precious metals that will increase in value as the economy and the U.S. dollar struggles. Higher healthcare costs will put an increasing strain on the economy, weighing on America’s competitiveness and the value of the dollar. There isn’t much we can do about rising healthcare costs, especially given the agenda in Washington, but we can prepare for it. 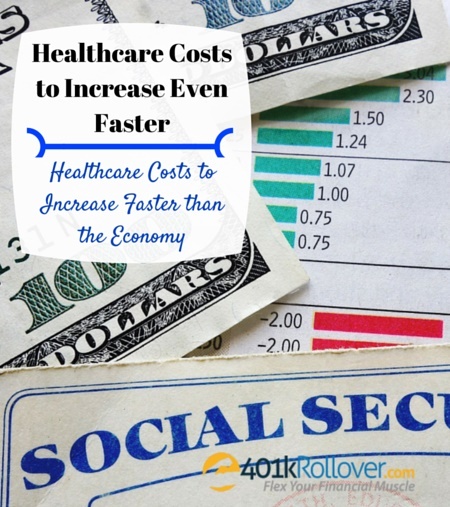 A higher burden of healthcare spending will hit corporations as well as individuals so make sure you take control of your retirement investments through a 401K rollover into an individual retirement account (IRA).